Gringo Records - SOUVARIS / SINCABEZA - "Clown Jazz"
Souvaris are a 5 piece rock band from Nottingham, UK, comprising of two guitarists, bass, synths and drums. Now ten years old, they have spent the last decade building their reputation as one of the UK's most inventive and versatile instrumental acts. Their contribution to this split release picks up from 2007's "A Hat" left off: developing an ever more direct and succinct approach to songwriting, the band channel their abundant energy in to tighter grooves and snappier riffs. Intricate rhythms are complimented by playful yet simple melodies, creating textures that are at once minimal and complex. In common with the most exciting instrumental bands of the last thirty years, Souvaris realise that wordless music need not be po-faced nor grandiose, and that fun can be clever too. 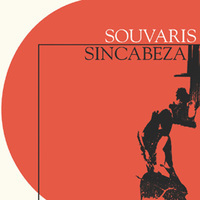 Sincabeza is Eric Camara, David Loquier, Philippe Rey and Antoine Vo Van Tao, four veterans of the Bordeaux rock scene. The band began playing together in 2002; initially a causal side-project in between other commitments (David drums for Laetitia Sadler's Monade), their natural perfectionism and committed work ethic has since seen them release two albums, play 200+ shows all over Europe, and place themselves firmly at the forefront of the blossoming French underground scene. Those attempting to pinpoint Sincabeza's music usually situate it in some uncomfortable hinterland between post punk, disco and noisy pop. Rather than indulging in such futile fancies of nomenclature, the four piece simply concentrate on the joy of playing, allowing themselves to follow whatever deconstructed and intricate path they choose - songs full of awkward variations, elaborate arrangements, razor-sharp breaks, and - increasingly - surprisingly poppy melodies. The quality of musicianship is second to none, and yet the band's raw, physical energy creates the impression that these songs could lose control at any moment. Sincabeza and Souvaris have toured extensively together over the last four years in the UK, Ireland and France, and this split release represents the consummation of a beautiful yet foolhardy tour van dream induced by sleep deprivation and cabin fever. Despite the discovery that working together over national borders and a distance of several hundred miles is difficult to say the least, both bands are delighted to have this document of their experiences together committed to vinyl. 500 copies on black vinyl. Comes with digital download.